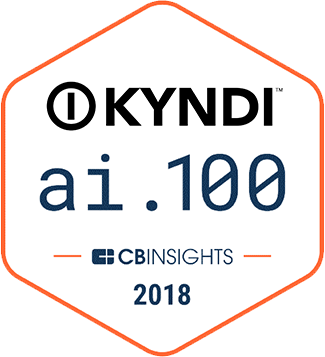 San Francisco, CA (December 12, 2017) — CB Insights today named Kyndi to the prestigious AI 100, a select group of promising private companies working on groundbreaking artificial intelligence technology. CB Insights CEO and co-founder Anand Sanwal will reveal the full list of the second annual AI 100 companies at the A-ha! conference in San Francisco. Companies such as Zoox, Shield AI, Zest Finance, Dynamic Yield, Appier, and CognitiveScale joined Kyndi in being recognized for their innovative technology in front of an audience of 400 senior innovation executives from around the world and news outlets including The Financial Times, CNBC, Reuters, Bloomberg and the Washington Post. Founded in 2015, Kyndi transforms business processes by offering auditable AI products. Its novel approach to AI, which unifies probabilistic and logical methods, enables organizations to analyze massive amounts of data to create actionable knowledge significantly faster and without having to sacrifice explainability. Kyndi’s Explainable AI™ Platform supports the following solutions: Intelligence, Defense, Compliance (i.e., for financial services and healthcare), and Research. Kyndi is an artificial intelligence company that’s building the first Explainable AI™ platform for government, financial services, and healthcare. We transform business processes by offering auditable AI systems. Our product exists because critical organizations cannot use “black box” machine learning when they are required to explain the reason for any decision. Based in Silicon Valley, Kyndi is backed by leading venture investors. For more information, visit www.kyndi.com.